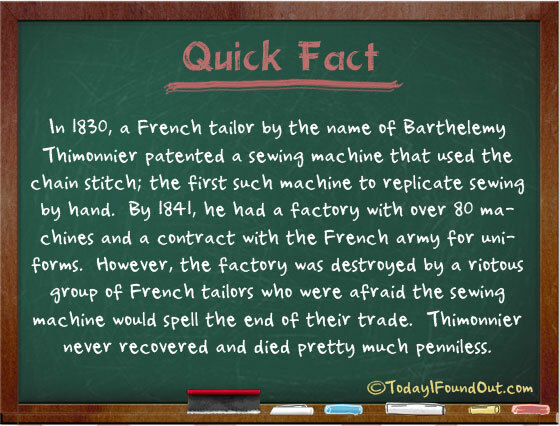 In 1830, a French tailor by the name of Barthelemy Thimonnier patented a sewing machine that used the chain stitch; the first such machine to replicate sewing by hand. By 1841, he had a factory with over 80 machines and a contract with the French army for uniforms. However, the factory was destroyed by a riotous group of French tailors who were afraid the sewing machine would spell the end of their trade. Thimonnier never recovered and died pretty much penniless.